The pakua is a symbol of the eight forces. In the Fusion of the Five Elements meditation the pakuas are used to gather and collect the energy of the organs and fuse them into a pearl. Here in the Cosmic Fusion meditation, the pakuas are again used to fuse energy into a pearl. Now, instead of just using the energy within the body, we combine the energy of the organs with the energy of the universe. This is a technique used in the Fusion practice to condense and gather the abundant energy that surrounds us into something that is usable and digestible to the body. Forming the pakuas will be used in all the Fusion formulas. 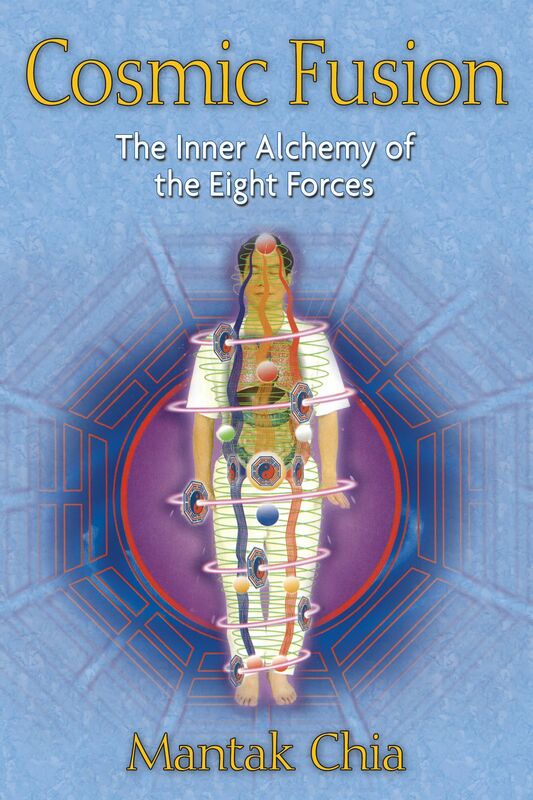 The first step is to form the pakua at the lower abdomen to connect with and attract the five energies and the eight forces. The goal is to balance and transform the emotional energies of the organs. The next step is to form the facial pakua. The facial pakua gathers and transforms the energy of the senses and the thoughts down to the lower abdomen. The universal pakua is then created to gather and collect the energy of the universe into the lower abdomen. All these energies once gathered are condensed into an energy ball, or a pearl of white light. This highly refined ball of energy is then circulated through all the channels as a way to open, heal, and revitalize the body, mind, and spirit. This is the beginning of the transference of consciousness to a new realm. It is important to get familiar with visualizing the pakua. Training the mind to concentrate on a single image is of immeasurable value for spiritual practice. The image of the pakua allows the mind to focus and fuse energy. This first step is essential to the rest of the Fusion practice. One of the best ways to get this image deeply connected in the mind is to draw it on a piece of paper and place it over your abdomen. Or, if you are a little more adventurous draw it directly on the abdomen. When you draw the pakua, use blue for Yin, red for Yang, and black for the frame. Sometimes it helps to work with a partner. Draw the pakua over your partner’s abdomen, and do the meditation facing one another. This way you can glance at the pakua and know what forces to work with. Be creative. Do whatever works so that you get the image planted firmly in your mind. The pakua is between the underside of the rib cage and above the pubic bone. While chanting the symbols of the trigrams, you can use your finger to draw them on your own abdomen, or while you look at the pakua on your partner. Kan (Yin-Yang-Yin). The power symbol of the Water gathering and Yin power, connected with the kidneys, ears, and sexual organs. Evoke the energy of the symbol by repeating its sound, Kan, several times or until you feel the connection with the energy of Kan, which is spreading down to the sexual organs and the kidneys. The Kan sound should come from the abdomen and the throat. 1. First chant the name of the trigram Kan in a long and deep sound while you picture the symbols and touch your lower abdomen. Your eyes look down to the lower abdominal area. 2. Next, chant the Yin and Yang lines of the symbol one after the other (Yin-Yang-Yin). Start from the inner side, close to the Tai Chi symbol. 3. Contract the Yin line: First expand the mind and the hands and palms to touch the universe, the cosmic. Chant the Yin, Yin, Yin as long as you feel comfortable, and continue moving your palms and draw the cosmic Chi from the universe into the navel, and feel the navel has suction. Feel your hands and the Tan Tien; the throat has the power of sucking the Chi down the Yin line to the navel. Rest. 4. Expand the Yang line: Be aware of the Tan Tien, throat, crown, and the palms close to the navel and slowly chant the long Yang sound and turn the palms out. Gradually move the palms to the left and right sides and feel your palms very long and big touching the cosmic. Rest and feel your palms in touch with the cosmic Chi. 5. Contract the Yin line again: Yin contracts; expand the mind and the hands and palms to touch the sky and the cosmic. Chant the Yin, Yin, Yin as long as you feel comfortable, and continue moving your palms and draw the cosmic Chi from the universe into the navel, and feel the navel has suction. Feel your hands and the Tan Tien; the throat has the power; the Chi goes down the Yin line to the navel. Rest for a while. Feel the vibrations inside as you chant the trigram. 6. Chant the trigram: Repeat the word Kan at the lower abdominal in your mind and let your eyes look down at the lower abdominal. Then close your eyes and picture the symbol: Kan (Yin-Yang-Yin). Smile and be aware of the kidneys, ears, and the power of the Yin and gathering power. Try to imagine them in your mind’s eye and feel them imprinted on your abdomen and vibrating inside you. 7. Rest and project the symbol into the universe and feel the symbol in the universe reinforce the Kan in the abdomen. "The extensive high quality color illustrations gracing most every page of Cosmic Fusion help to elevate what might otherwise have seemed to be an esoteric book on advanced Taoist alchemical energy meditation practices to a very high level of practical applicability."